As part of their treat to their loyal supporters, Jordan Brand is set to release a new colourway of the Jordan TE 3 Low, which is expected to be a hit once it hits the market this October. A part of the Jordan Team Elite family, this Jordan TE 3 Low will be dropping in Black/Varsity Red colourway, which is simple yet very impressive edition. 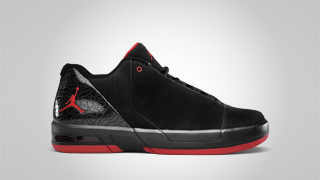 The shoe features an all-black upper part accented with varsity red outsole and Jumpman logo. So if you are looking for a fresh new look, this one is recommended! Jordan SC-2 Hitting Shelves Once Again!